Science in early childhood is all about prediction, exploring, and discovering answers through questions. Measure, pour, transfer water, and get dirty. Science is all about hands-on learning, and the best place to get your hands messy is outside! Easi-Detectors are guaranteed to provide hours of fun outside in the sandbox or indoors at the sand table. Begin the processes of prediction, planning, collecting, and data recording. Keep this simple and your children will ask more and more. If certain questions can be extended, incorporate other aspects of your play with their interests. 3. Ask them lots of questions too! Asking children "why", "what if", and "how" questions as they play will get them thinking critically about their actions and about the objects around them. Plant seeds and allow children to experience hands-on scientific learning. Discuss water, light, sunshine, and all the things that plants need to grow, or experiment with these elements to see how different amounts of each affect the plant growth. 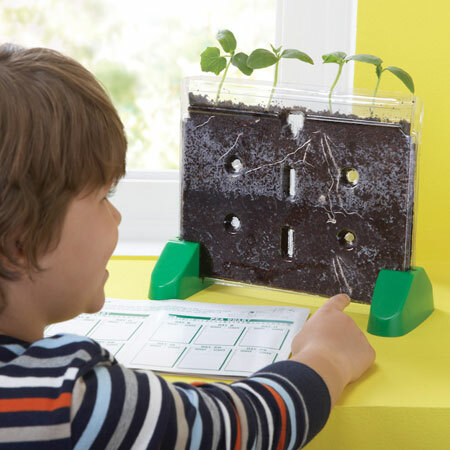 The Sprout and Grow Window lets children see first hand how a seed sprouts into a plant. 5. Watch butterflies grow up and set them free! Every spring at Scholar's Choice we bring in Painted Lady caterpillars that anyone can take to their home or to school and watch them grow. It is so exciting watching the tiny caterpillars grow and make their chrysalises, then releasing them to the wild.